You all know life has it ups and downs. It seems it works for all of the aspects of life. Because this is mostly food blog let’s talk about food ups and downs. There are times I challenge myself with new recipes, with preparing meal plans a week ahead, when I try add more veggies into our menu. There are time when I cook whatever is simple enough, sometimes we eat frozen pizza, sometimes I don’t care about veggies. 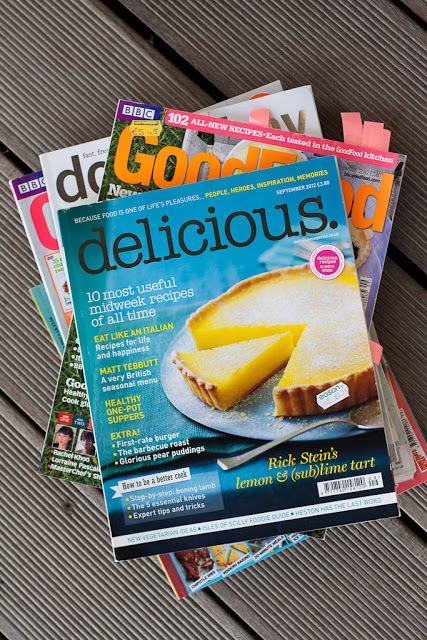 Most of the time I tend to buy food magazines. Most of the time I read them, or at least flick through them. But there are times when I just stare at the lovely photos and do nothing. The magazines pile up as well as my guilt. Magazines are so expensive, I feel that they should earn theirs place in my monthly budget. So before I allow myself to buy another magazine I need to use the ones I already bought. This time I didn’t have a choice. I bought Delicious Magazine only because of the tart photo on the cover. The tart looks beautiful. 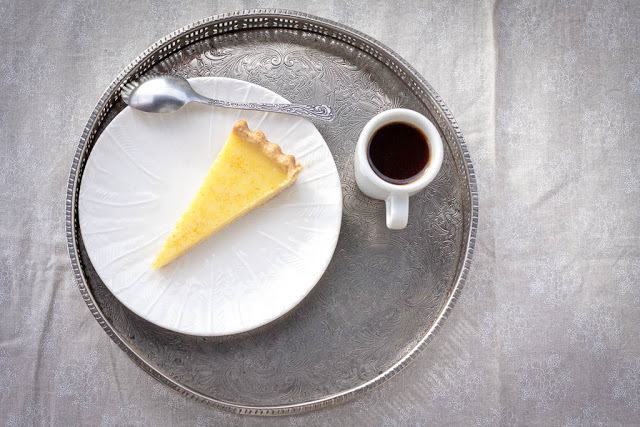 I haven’t made a lemon tart for ages. So no excuses. Do your magazines earn their living? 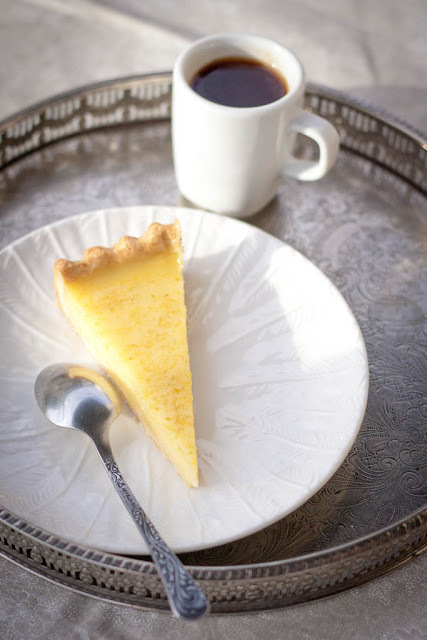 The tart is really simple with the citrus filling that is really smooth and soft, more like a cream. Recipe comes from Delicious Magazine September 2012 with my small alternations. There was enough of pastry to make two tarts. Sift the flour, icing sugar and a pinch of salt. Add the butter. Add the egg yolks and 1-2 Tbsp cold water and knead it quickly. Don’t overwork the dough. Wrap it into cling film and refrigerate for at least 30 minutes (you can even prepare it 2-3 days before, or you can freeze it and store it for few months). Roll out the dough on a lightly floured work surface until it covers the tart base and its sides. Transfer it gently into the pan. Press the dough evenly into the bottom and sides of the pan. Prick the dough with a fork. Refrigerate for another 20-30 minutes. Line the crust with parchment and fill with baking beans, and bake blind in the oven for 12-15 minutes until the edges are biscuit coloured. Remove the beans and bake it for another 3-4 minutes. Brush the pastry with a little of the beaten egg white. Bake for another 2 minutes. Remove the pastry from the oven and lower the oven temperature to 120°C/100°C fan. Finely grate the zest from lemons and limes, then squeeze out enough juice from all the fruits to give 150-175ml. Lightly beat the eggs and sugar together until just mixed but not frothy. Mix in the citrus juice and cream, pour through a sieve into a measuring jug, then stir in the lemon zest. Put the pastry case into the oven and pour the filling in. Carefully slide the tart into the oven and bake for 45-50 minutes until just set. The mixture should be still wobbly. Remove and cool, but not refrigerate (well I did refrigerate it, and nothing bad happened). Posted in Cakes, Easter, Summer and tagged cream, lemons, limes, tarts. Bookmark the permalink. Love, love lemons! I have a lemon tree in my back yard that produces amazing lemons with a flavor that you cannot buy at a grocery store.